Mesa Verde ticket sales could help bring more tourists to Durango this summer. At the same time, developers are planning to make long-term investments in town and build an additional 450 hotel rooms. Durango already has 2,000 hotel rooms. Two hotels are planned for East Second Avenue between Fourth and Fifth streets. The hotels were originally approved in 2014. Two hotels are planned to share a building on Escalante Drive. A medical building is also planned for the same complex. A three-story hotel is proposed for Camino del Rio between Ninth and 11th streets, next to Natural Grocers. It will have a parking garage underneath. Durango appears on the cusp of experiencing a hotel boom, with six proposed lodges in the planning process that would add up to 450 rooms to the town. The boom comes shortly after the completion of four new hotels during the last four years in Durango, including La Quinta Inn & Suites, Fairfield Inn & Suites by Marriott, Holiday Inn & Suites and the Homewood Suites. With about 2,000 hotel rooms already available in Durango, some may wonder if the town is hitting its saturation point. But tourism officials say they have good reason to believe tourism is a growing industry, and several factors are at play that will only increase the number of visitors coming to Durango in the foreseeable future. Among those: Tickets for Mesa Verde National Park tours are available for purchase for the first time at the Durango Welcome Center, which is expected to bring an additional 7,500 to 30,000 visitors to town this summer, said Frank Lockwood, executive director of the Durango Area Tourism Office. “This is a huge deal,” he said. Also, DATO is working on an agreement with Sky Ute Casino Resort to promote the casino as a destination for conferences, with the expectation that some visitors will stay in Durango and ride shuttles to Ignacio for conferences. Mesa Verde ticket sales and an agreement with the casino would help fill the 450 new hotel rooms, Lockwood said. “I have no worries,” he said. Recent occupancy data for Durango hotels is not available. But in 2015, the executive director of DATO estimated the city’s hotel occupancy rate – with 1,800 rooms at the time – was around 70 to 80 percent. The six new hotels planned for Durango include two new hotels on East Second Avenue, a new hotel on Camino del Rio and one along South Camino del Rio near Allen Theaters. Last week, the Durango Planning Commission approved a MainStay Suites and a Sleep Inn on Escalante Drive that are expected to share a building. Construction of the two hotels is expected to start in the fall, and they may be ready to open in April 2020, developer Charlie Albert said. Lockwood said he is confident Mesa Verde ticket sales will help fill rooms because tickets must be purchased in person, and Durango is the only place outside of the national park to buy them. Ticket sales at the Colorado Welcome Center in Cortez ended in October and are not planned to restart. Visitors can drive to Mesa Verde to buy tickets, but they run the risk of the park selling out before they arrive, he said. Currently, about 600,000 people visit Mesa Verde annually, and about half of them also visit Durango. “We are trying to capture the extra 300,000,” Lockwood said. The Welcome Center in Durango has already started to see an increase in traffic from tickets sales, Lockwood said. On Thursday, the office sold 160 tickets, and DATO estimates 100 of those visitors never planned to stop in Durango, he said. He could not predict how many of the new visitors might translate into overnight hotel stays. Sky Ute Casino Resort’s conference center has space for 800 people, but its hotel has only 140 rooms. It makes sense for some conference attendees to be housed in Durango hotels and take shuttles to the resort, he said. In general, Lockwood expects the tourism industry to continue to expand in town and across Colorado. Tourism accounts for about 26 percent of the jobs in La Plata County, more than any other sector, according to Region 9 Economic Development District of Colorado. 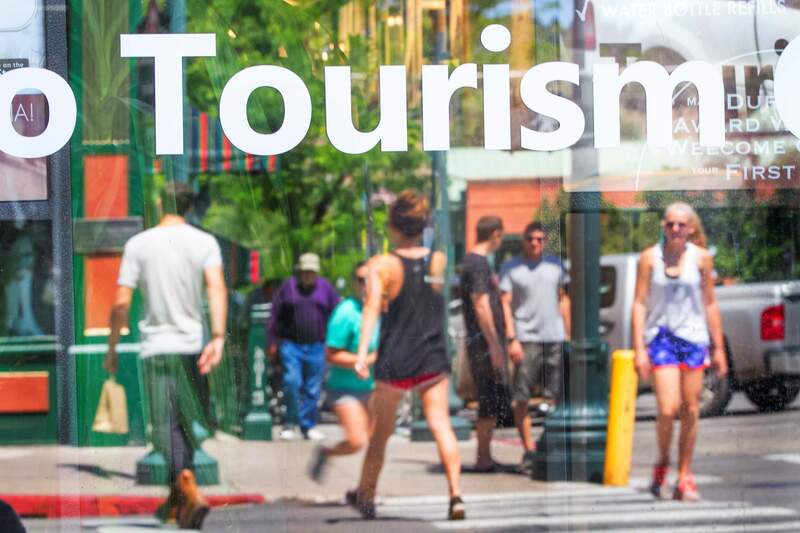 Even though tourism accounts for a quarter of the jobs in La Plata County, it’s not expected to be the fastest-growing industry over the next 10 years, according to Colorado Department of Labor and Employment. Rather, hospitals, fabricated metal product manufacturing and specialty trade contractors are expected to be among the top five fastest-growing sectors. It is healthy for other sectors to outpace tourism in La Plata County, said Roger Zalneraitis, executive director of the La Plata County Economic Development Alliance. Tourism attracts new residents who start and grow new businesses, and tourism-based companies often mature and diversify, he said. However, jobs in tourism tend to be fairly low paying. For example, those working in accommodation and food tend to earn an average of about $20,000 a year, Region 9 data show. When tourism is one of the sole drivers of an economy, workers often must commute long distances to reach resort communities, he said. Does Durango need six new hotels?